A Texas Hill Country retreat that, like a resort, is separated into family quarters, guest quarters, and indoor/outdoor spaces. 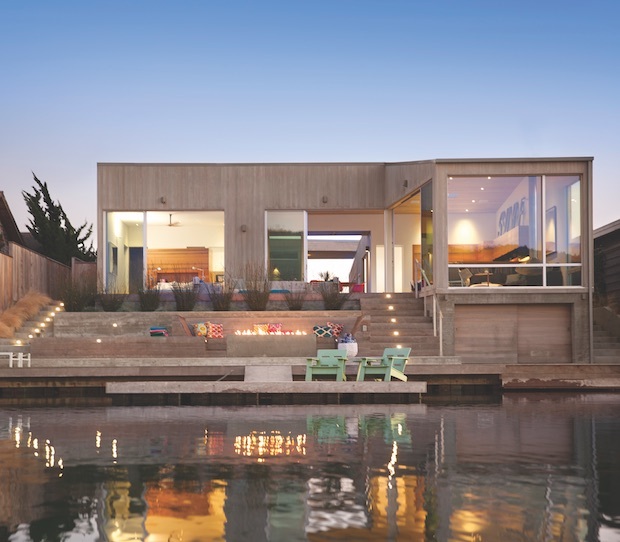 A home on a lagoon in Northern California with glazing that lets in spectacular natural light. 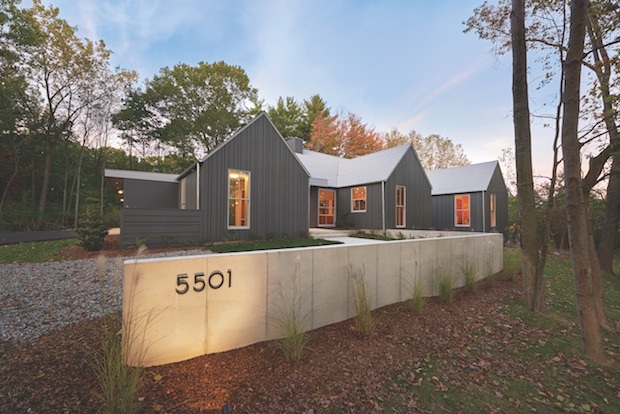 A modular home in Grand Rapids, Mich., that feels much larger than it appears and showcases numerous custom touches. 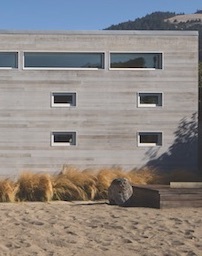 All three homes were designed with great sensitivity to their sites. 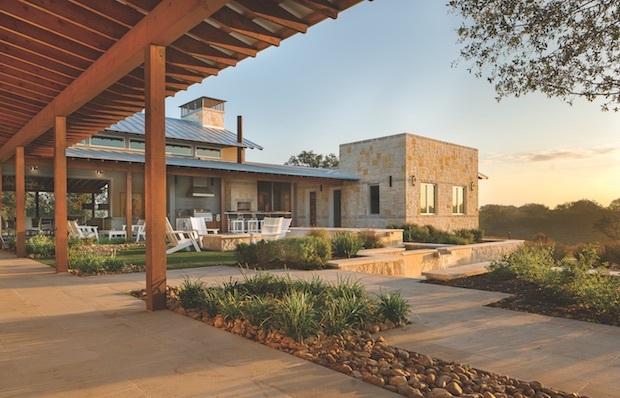 Judges lauded the Lagoon House’s physical and visual connection to the water, and the use of stone to unify Piebald Ranch, with its Texas Hill Country site. Overall, the jury was impressed by the simplicity and purity of form of these projects and the details that make them truly one of a kind. 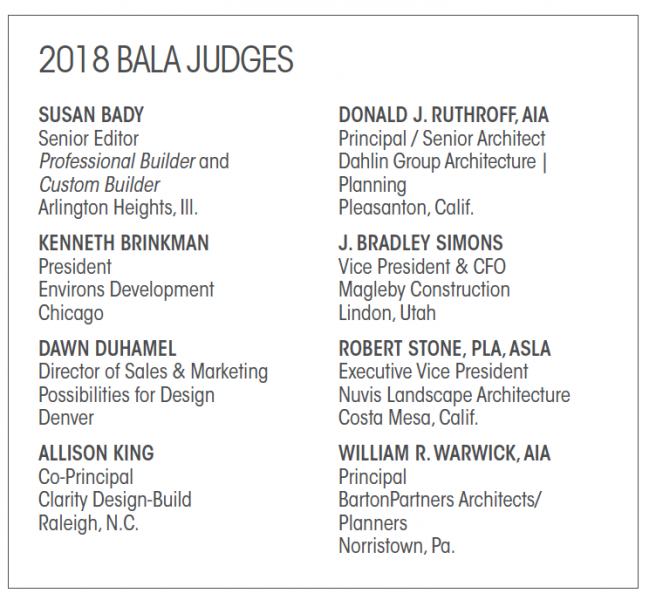 BALA is one of the nation’s foremost residential design competitions and continues to redefine excellence in home building. Every year, the program recognizes good design in single-family and multifamily homes of all types and sizes, as well as communities, interior design, remodeling, and rental developments. For more information and images of the 2018 BALA winners, visit bestinamericanliving.com. —S.B. This ranch retreat located just south of San Antonio, is intended for family and friends to enjoy the year-round beauty of Texas Hill Country. Architect Craig McMahon made sure to maximize the site and the conditions to accomplish that goal. To take full advantage of the site, McMahon oriented the house to embrace the prevailing southeast winds of the Gulf and used covered porches on all sides of the home for protection from the sun. Architect Craig McMahon designated this modern ranch home with historical Texas details, some based on 18th-Century German influence. “The west side is protected with deep overhangs as well, with more limited glazing,” the architect says. “The home is designed to be one room wide—a German historical building method—so you can open the windows or doors on one side of a room as well as on the opposite side, allowing for passive cooling during the summer.” In addition to energy-efficient doors and windows, the house includes spray foam Icynene insulation to seal the house. Limestone with matching mortar graces the exterior and interior walls of the home. Wood ceiling and rafters provide visual warmth. A Texas covered parking barn (clad in rusting metal) greets guests as they approach. A short walk across the front lawn takes visitors to the entry, which connects to the main courtyard, a Texas-styled oasis that includes a pool, seating, fire pit, and outdoor kitchen area for entertaining. Measuring about 4,400 square feet, the home is separated into three distinct areas: family quarters (master bedroom suite, ranch office, and bunk room for children), guest quarters, and indoor/outdoor spaces. The main home features an open-kitchen/dining/living great room with tall wood-clad ceilings. 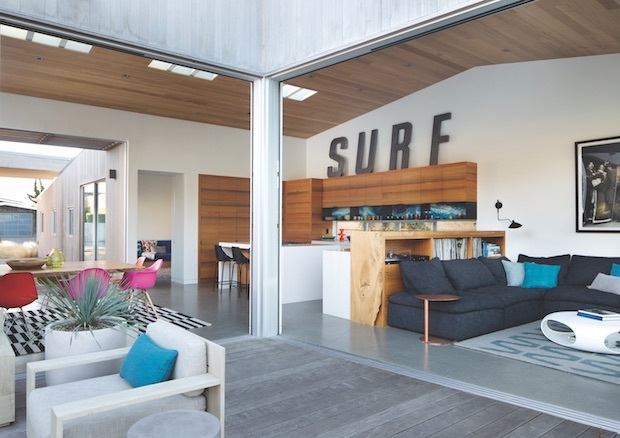 It embraces the indoor/outdoor connection with pocketing sliding doors that open up the room. A guest wing offers visitors their own private hotel-like accommodations. McMahon sited the house to maximize the prevailing southeast winds of the Gulf, and he used deep porches to protect homeowners from the summer sun. Piebald Ranch was constructed to look and feel like a modern Texas ranch home but with historical details, such as wood overhangs with stained wood battens to allow the underside of the metal roof to be seen—“a German-influenced detail of the 1700s to 1800s,” McMahon says. The firm clad the home in Texas Sisterdale limestone with matching mortar and used fiber-cement siding as an accent. 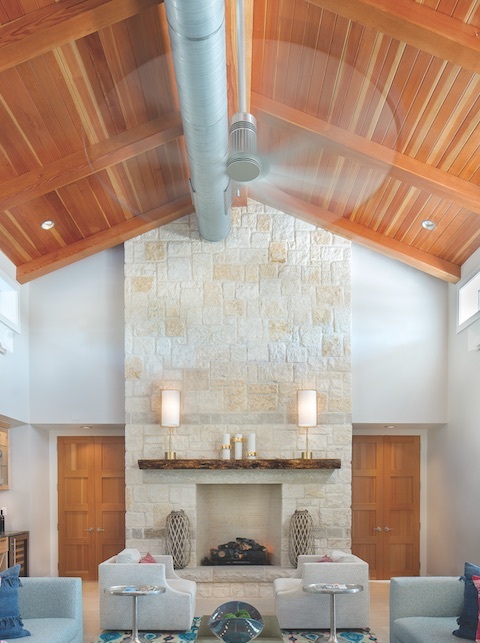 Lueders limestone covers the flooring inside and out, blending the boundaries between spaces. The overhangs are made from exposed, stained cedar. Judges lauded the project for its skilled interpretation of the regional vernacular and praised its use of stone. “The outside and outdoor elements are excellent,” another said. —N.F.M. Designed for a family that lives in San Francisco, this 2,100-square-foot weekend residence is the perfect place to decompress from the hustle and bustle of the big city. 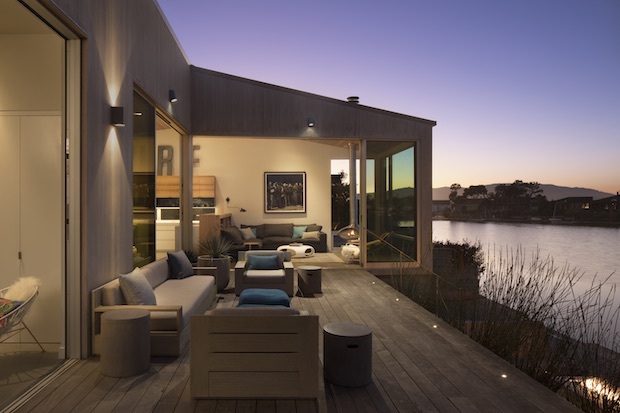 Located in Marin County, where coastal codes require houses to be elevated above sea level, the home sits high in relation to the lagoon and ocean. As a result, San Francisco-based CCS Architecture designed the building with two distinct sides: The north side features decks and steps cascading down to the water, while the south side is more level and expansive, with exposure to the southern sun. Featuring honed and sealed concrete floors throughout, the house includes large doors from Fleetwood Windows & Doors and All Weather Architectural Aluminum to help bring in light and fresh air. With this bilateral design, CCS Architecture says, the main spaces of the house open up for maximum indoor-outdoor living and capture as much light and fresh air as possible. “The form of the house is essentially a courtyard, yet with the higher roof cantilevering over the courtyard entry to create an iconic portal to the house as seen from the road,” the architect’s project statement reads. 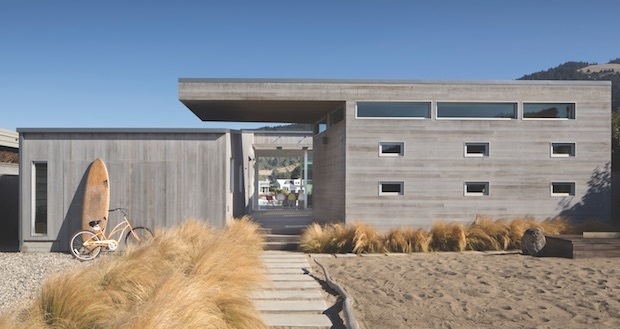 A standing-seam aluminum roof and Western red cedar siding stained with bleaching oil create a hardy exterior for this Marin County beach house. CCS Architecture designed the 1,900-square-foot home to be net-zero energy. Built by Allen Construction, in Sebastopol, Calif., the home uses standard wood framing, except on the lagoon side, which needed a steel moment frame to support the large window. It’s also loaded with sustainable and high-performance features, attaining a platinum rating from the Marin County Development Code and achieving net-zero energy. Photovoltaic panels generate all of the home's electricity, sending surplus energy back to the grid and running all of the home's systems, including hot water, HVAC, and radiant heating. To accomplish its sustainable and high-performance bona fides, the house has a 7-kilowatt solar system, drip irrigation to reduce water use, a fly-ash-based concrete foundation, Forest Stewardship Council–certified wood for wall framing, low-flow plumbing products, LED lights, high-efficiency appliances, and radiant floor heating over an insulated slab, among other features. CCS Architecture specified a lush palette of materials for the exterior and interior, including Western red cedar siding, a standing seam aluminum roof, and ipe decking. Inside, the palette includes honed and sealed concrete floors, fin ply millwork, sinker cypress cabinets, and quartz counters. The ipe decking will weather to a silvery gray color, but the structure will remain stable. 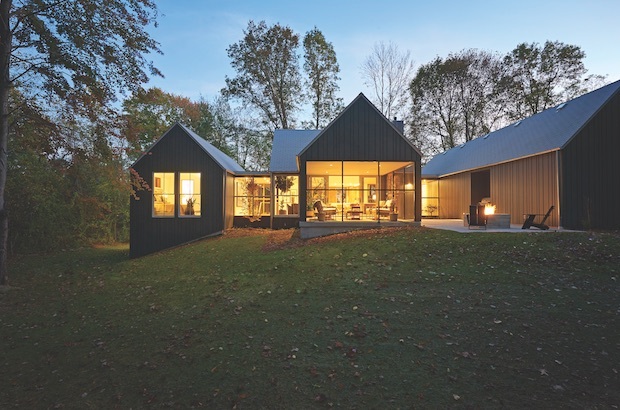 The architects say the home is an example of streamlined simplicity, and the judges agree. There is “nothing not to love,” according to one judge. —N.F.M. BUILDER Jim Allen, Allen Construction, Sebastopol, Calif.
For a unique look, slate-colored vertical trim boards in random varying widths were placed over much of the home's exterior. The design and construction of the builder’s own home pushed the envelope of what was possible in his Western Michigan market. 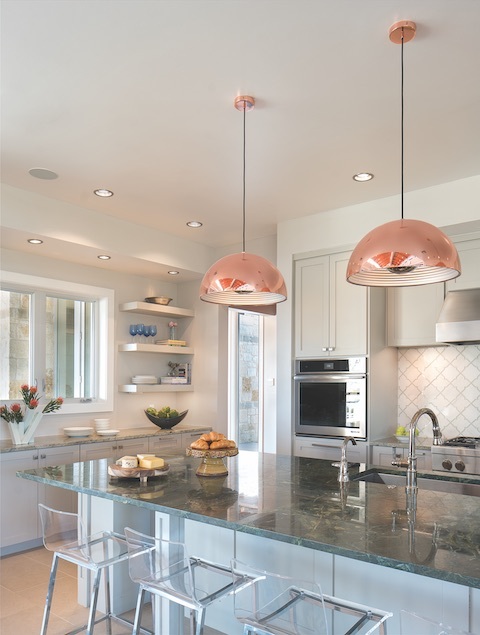 Scott Branc, owner and principal of Grand Rapids, Mich.-based New Urban Home Builders, pulled together a team of designers and gave them free rein to try new, creative solutions. “I try to tell my clients, ‘You need to trust the people you hire,’ so I wanted to follow that exercise through all the way,” Branc says of the approach. The three team members, including Branc, residential designer Jeff Visser, and interior designer Rock Kauffman, had worked together before and were able to collaborate in a way that gave them each space to freely use their talents. Floor-to-ceiling double-hung windows admit light into much of the home's main living area. The goal was to create a home with a contemporary architectural look while maintaining a warm, inviting feel. It was also an experiment in efficient use of space: The interior—3,200 square feet broken into three modular sections—seems much bigger than it is. The team accomplished this with an open floor plan and alternating cozy, 8-foot ceilings in the kitchen and entryway with ceilings nearly 17 feet high in the living room. The kitchen cabinets and refrigerator are faced with a high-gloss wood-grain laminate, keeping the kitchen palette warm but modern. 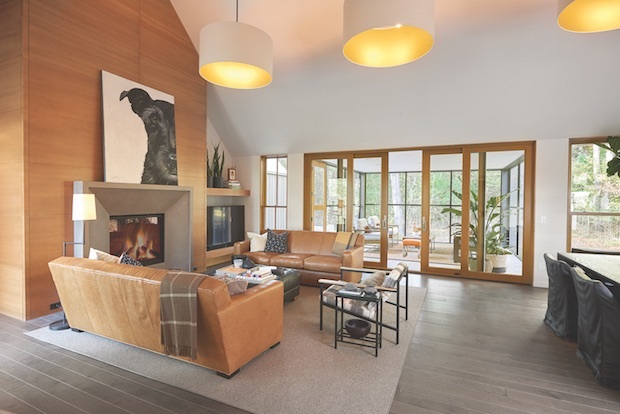 Capitalizing on the privacy that came with the home’s wooded lot, the team used abundant floor-to-ceiling double-hung windows throughout the main living spaces, including a sunroom surrounded by windows on three walls. Because of the home’s segmented layout, the windows provide views into other interior living spaces, in addition to the outdoors. The Douglas fir that surrounds the windows and fireplace appears elsewhere in the home for continuity. 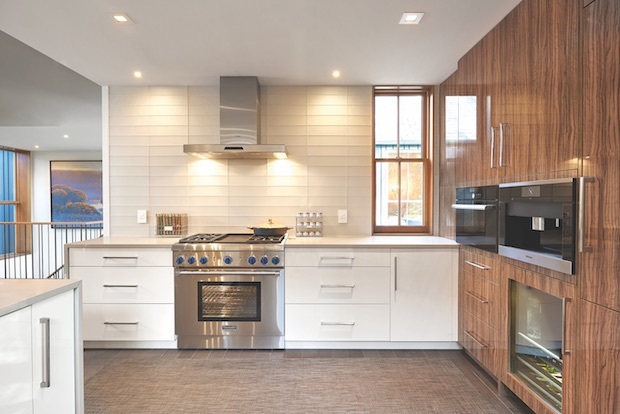 The finishes inside reflect the home’s surroundings, with warm Douglas fir details and engineered maple floors throughout, as well as the eclectic, high-gloss wood-grain laminate covering the cabinets and refrigeration in the kitchen. A visual connection between the slate-colored vertical cladding—installed in irregular widths randomly around the home’s exterior—is created by use of a matching interior accent wall and custom stair detail. To gain familiarity with the home automation systems that he specifies in client homes, Branc included a Crestron Electronics platform that allows elements such as lighting, thermostats, security, and blinds to be controlled and scheduled. The system was chosen for its affordability and ease of adding new elements. In addition to being the Branc family’s residence, this home will now serve as a design and technology demonstration space for Scott Branc’s clients and as a venue for New Urban’s professional gatherings. —A.H. RESIDENTIAL DESIGNER J. Visser Design, Forest Hills, Mich. 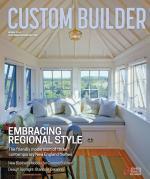 Comments on: "Three Custom Homes Honored in the Best in American Living Awards"